Crel Vogel sees various reasons for buyers at the high-rise condo project in the Kierland area straddling the Phoenix border with Scottsdale. One of them is actually wealthy buyers looking for homes closer in to reduce expensive Uber and Lyft bills. 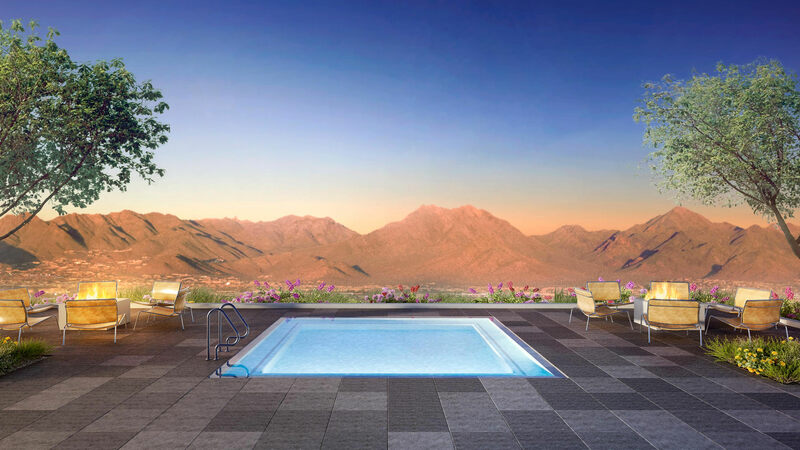 Vogel is the Arizona Regional Sales Manager for Polaris Pacific, the high-end real estate firm marketing the Optima Kierland condos being built on Scottsdale Road in Phoenix. They are near the popular Kierland Commons and Scottsdale Quarter shopping centers. The condos range between $320,000 and $1.75 million and are 75 percent sold out. They are being built by architect/developer David Hovey Jr..
Hovey is known for other Optima developments in Scottsdale with hanging gardens designs of trees, bushes and plants built into building structures. Vogel said there are 162 condos at the Kierland project under contract. That leaves 55 units still for sale. The condo development is 12 stories and is next to a 10-story apartment tower. Vogel said he’s seeing buyers from the Midwest, Seattle and California but many of the condo buyers are from north Scottsdale and are looking for proximity to restaurants, bars and shoppings. He said the wealthy subdivisions of north Scottsdale, Cave Creek and Carefree have desert scenery and privacy but aren’t close to amenities. “You have golf or you have golf,” Vogel said. He said there is appeal for those suburban buyers to be able to walk or drive across the street to Kierland or Scottsdale Quarter’s restaurants, bars and shops. Scottsdale Quarter has an Apple Store (Nasdaq: AAPL), H&M, Urban Outfitters(Nasdaq: URBN) and Nike Store (NYSE: NKE). Vogel has also heard from more than one buyer that being closer into would reduce their Uber and Lyft bill. Vogel said those can run as much as $1,000 per month for some wealthy consumers who live farther away from town but use the ride services to get to and from restaurants, bars and socializing. Uber and Lyft can also help users avoid potential DUI troubles in high enforcement states such as Arizona. Of course, the likes of General Motors (NYSE: GM), Uber, Tesla (Nasdaq: TSLA) and Alphabet (Nasdaq: GOOGL) are developing driveless cars that would also help get their owners to and from places.